Posted on December 1, 2010 by EL CHAVO! 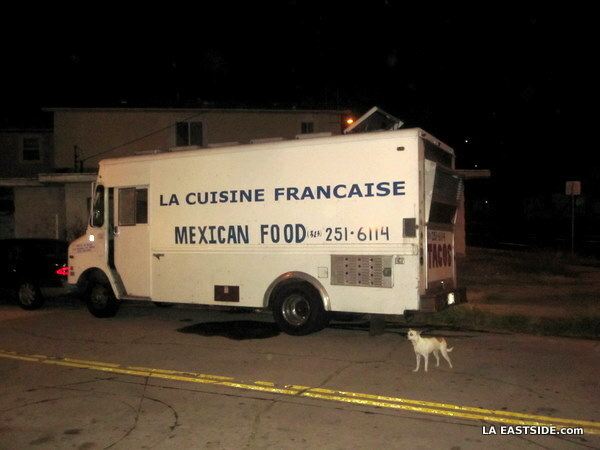 Somewhere in El Sereno a Mexican food truck that tends to the taco business goes by the name of “La Cuisine Francaise”. Hey, they have no twitter feed so that works for me. But the dog seems a lil’ bit scared, por que sera? Bon Appetit! This entry was posted in Eastside, Food by EL CHAVO!. Bookmark the permalink. It’s in residence just outside the parking lot of Our Lady of Guadalupe in Rose Hills most nights (as is that dog). Tacos just so-so. I agree with the first comment. Actually, they’re not great at all. They better not be making crepes al pastor…. hmph. Somebody’s getting the jump on that hipster dollar. the dog ain’t scared, he’s confused and sad and wondering where his lady at, they were supposed to meet: ¿Donde ‘sta la poodle? où est ma petite amie???? ma chérie, ma chérie….!!! I’ve passed by that truck about 6 times and each time, as I approach, I say to myself, “Wow! French food in El Sereno, so cool!” Then I ride by and I’m always disappointed. It is a point of personal honor that I’ve never stopped to eat at this misleading truck. Or they could put a “Just Kidding!” under their name.